What Is Happy? Part Two! Can’t believe I forgot this yesterday! 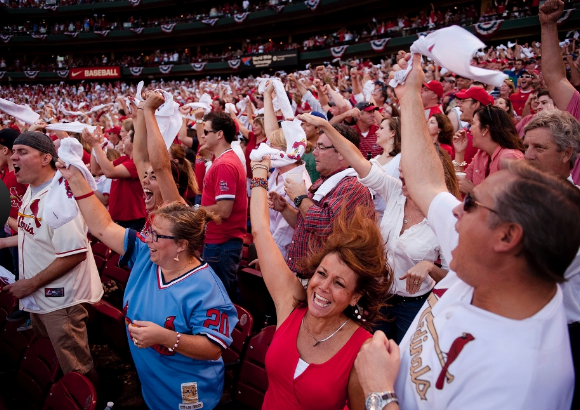 The St. Louis Cardinals being in the play-offs makes me happy. Not so much because I’m a huge fan living far away for so many years now but because my 81 year old Mother is. She began really watching the sport several years ago just to share something with Dad. Unexpectedly she dug it! He’s been gone now going on 4 years and she never misses a game. She can talk stats with the best of ’em. I am happy hearing how happy she is cheering for “her boys”. 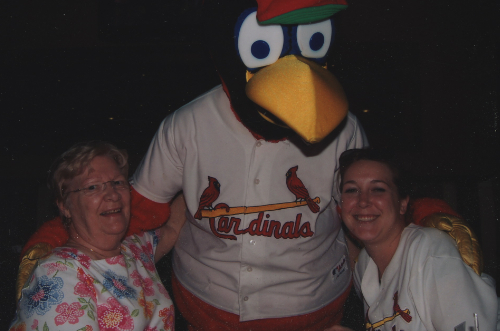 Mom & granddaughter, Kelly w/Fred Bird during a home game!